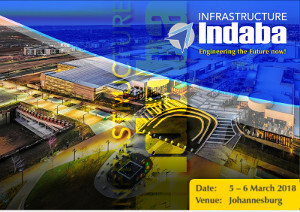 CESA Infrastructure Indaba Day 1– Engineering the Future now! MEC for Infrastructure Development in Gauteng Jacob Mamabolo, Keynote Speaker at the 7th Annual CESA Infrastructure Indaba, taking place at Southern Sun, OR Tambo International, told the conference that it gives him pleasure to spend time with fellow industry players especially consulting engineers and built environment professionals “as we seek ways to improve our work in the delivery of infrastructure projects that are a key anchor and an enabler to a growing a thriving economy”. Consulting Engineers South Africa (CESA) welcomes the recently announced changes to the cabinet and executive of President Cyril Ramaphosa. In particular, CESA welcomes the return of highly respected and competent ministers to the critical portfolios of Public Enterprises and Finance. Both Minister Gordhan and Nene have a challenging task ahead of them to get both South Africa’s SOE’s as well our economy on an upward curve again. CESA is confident however that under the stewardship of both these ministers, positive international sentiment and hence investment will begin to flow once again. Consulting Engineers South Africa (CESA) is encouraged by the impassioned call from President Cyril Ramaphosa for commitment to ethical behaviour and ethical leadership, a call which resonates strongly with that expressed by its own leadership. The organisation further commends President Ramaphosa for stating that infrastructure investment is key to growing the economy. CESA welcomes the intervention to decisively stabilise and revitalise state owned enterprises (SOEs) as well as those implicated in State Capture. Consulting Engineers South Africa (CESA) is hosting its annual Infrastructure Indaba from the 5-6 March 2018 in Ekurhuleni, Gauteng. The two-day session will bring together leading experts including government officials, consulting engineers and built environment professionals for the purpose of improved delivery and management of public infrastructure. CESA will host its annual Infrastructure Indaba from 5-6 March 2018 in Ekurhuleni, Gauteng. Consulting Engineers South Africa’s (CESA) newly appointed President, Neresh Pather, presented his presidential message and theme for the year at a function held in Johannesburg this morning. Pather’s focus for the year will be on Effective Ethical Leadership with the theme of ‘Our Future is Now!’ He stated that change can be effected if we believe in it and work hard enough to achieve it and that with great leadership we can succeed! The results of Consulting Engineers South Africa's (CESA) Bi-annual Economic and Capacity Survey for the period January to June 2017 just released indicates that there has been some improvement with the net satisfaction rate to 96.3% in the June 2017 survey from 87.5% in the last six months of 2016. At Consulting Engineers South Africa’s (CESA) 64th Annual General Meeting held at the CESA Seminar in Johannesburg on Tuesday 7th November, Neresh Pather from Mott MacDonald Africa was inaugurated as President of the organisation for the next two years, succeeding Lynne Pretorius. Sugen Pillay, Managing Director of Zitholele Consulting was elected to serve as Deputy President of CESA for the same period. Women’s Forum Page is currently under construction, in the interim please feel free to access the first edition of recommended reading.